The breadth and depth of artistic drives at large in Russia during the dying days of the Romanov dynasty are the focus of this debut album by young Bankok-born pianist Poom Prommachart. The music reflects everything from the die-hard conservatism of Medtner to the introspective mysticism and harmonic daring of late Scriabin. Winner of the second Sussex International Piano Competition and a recent Shigeru Kawai Artist, Poom is regarded as one of the most accomplished Thai pianists today. Described by a critic as �a young Ashkenazy�, Poom was a hugely successful student. He received the most prestigious Tagore Gold Medal for his outstanding career and contribution to the RCM, which was presented to him by HRH The Prince of Wales . Liszt dedicated the published score of Variations on a Theme of Bach to Anton Rubenstein � the two men met in Paris in 1840. He built the variations on material from the first movement of the same cantata which Bach revisited for the Crucifixus of his B minor Mass, but which yields to Liszt�s Romantic invention, growing towards a catyclysm out of which rises a chorale. 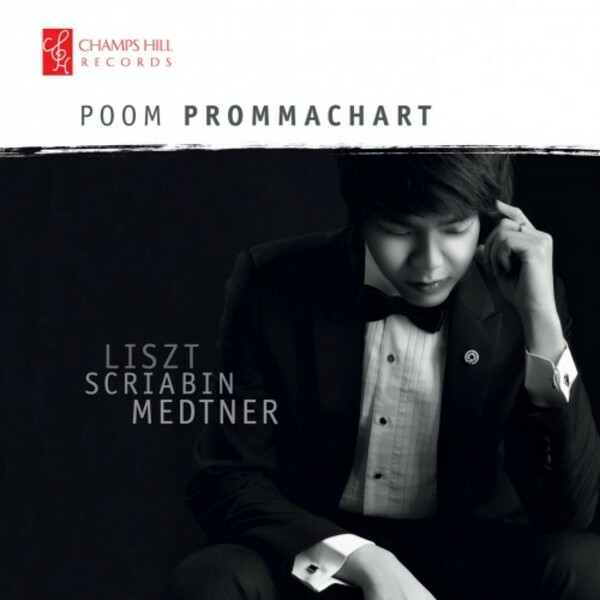 Poom describes Scriabin�s Black Mass sonata as �a conversation between human and demon�, the result of the composer�s deep immersion in esoteric philosophy, and here he explores the mind�s shadowy side, drawing dark forces into the light of awareness. Medtner is a favourite composer of Poom�s, and he enjoys the opportunity �to inject spirit and powerful imagination� into the piece � so appropriate here in music which takes its cue from the song of the water-nymph, or rusalki, whose siren songs lure young men to their deaths by drowning. A series of variations creates a labyrinthine world of elves, gnomes and winged dancers. The transcription of the famous Liebesfreud, Poom�s encore on the disc, was the result of another great friendship, that of Rachmaninoff and Kreisler who met in 1918 in New York. The first performance in 1925 was hailed as a great success.